Colin Farley submitted this photo and caption. 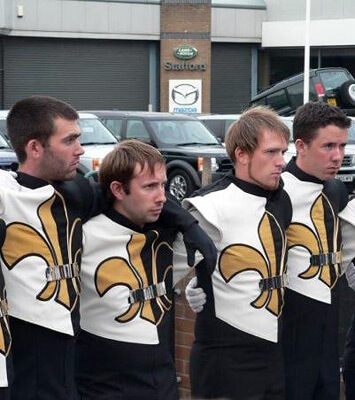 This is a photo of the DCI corps veterans that were a part of the 2007 37th Kingswood horn line from Bristol, England. From left to right: Rob Quick (Santa Clara Vanguard 2005-2007), Alex Fricker (Glassmen 2004), Daniel Gannaway-Pitts (Colts 2005-2007), and me, Colin Farley (Colts 2001-2004, 2006, Bluecoats 2005). This photo was taken during a pre-show talk before our performance in Stafford. I know now how our British friends feel when they come to the U.S. for drum corps, as I was the only American in a corps full of crazy Brits! I had a great time, and can't wait to visit again!